For those who haven't finished shopping for school supplies yet, you still have (a little) time. The lists are short again this year for Canby families, with the School Supply List Initiative, first established in 2017, still in place. The initiative has been a priority for Superintendent Trip Goodall, and exists to reduce the cost of school supplies for Canby's elementary students. "Students are entitled to a free public education," said Autumn Foster, Canby School District communications coordinator. "By providing some of the basic tools, we are removing barriers that can impact a student's education. This initiative aligns with our district goals of equity and education and improving student achievement." The district spent nearly $50,000 on school supplies for the 2018-2019 academic year. The district will continue to budget for these supplies, Foster said, but does not have funds to provide supplies for middle and high school students. However, if any student needs help with supplies, they can contact their school's office to receive assistance thanks to partnerships with the Canby Center, Freedman Orthodontics and others. The initiative is not only for students and families though, it is intended to help teachers as well. "While we would never ask a teacher to spend their own money on supplies, we know it does happen," Foster said. "We hope this initiative helps eliminate that practice." 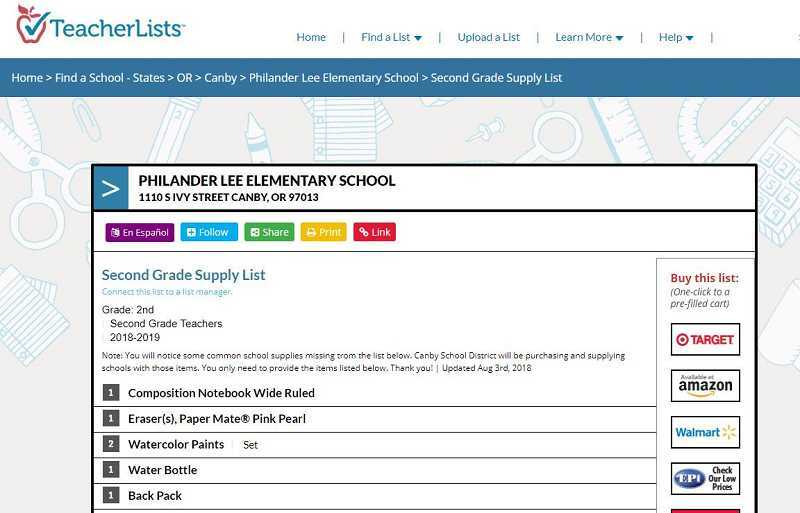 Even with the initiative, families still have lists to check off, and all of Canby's lists are located in one handy spot at teacherlists.com. With the site, in just a click or two, families can find their child's exact list and even click over to a pre-filled shopping cart on Target, Walmart, Office Depot, Amazon and more to purchase the list. "For decades, the supply list process has been frustration for parents," said TeacherLists President John Driscoll. "Where to find the lists? When are they available? Forgetting the list on the counter at home. Hunting the aisles for the specific items their teacher has requested." The first day of school comes after Labor Day for Canby students, as follows. Tuesday, Sept. 4 is the first full day for 1st through 6th grades and for all Ninety-One School students, and is a half day for Baker Prairie 7th grade and for 9th grade. Wednesday, Sept. 5 is the first full day for Baker Prairie 8th grade students and for 10th through 12th grades. Kindergarten start dates vary by building, and parents should contact their school directly if they missed that information.